These lovely 4 bedroomed semi-detatched holiday homes are located on Valentia Island in the picturesque town of Knightstown. 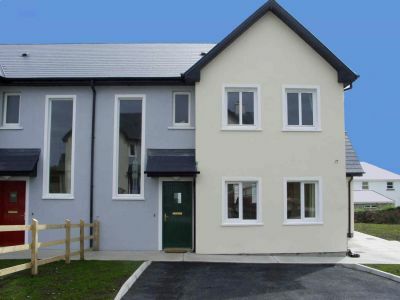 These beautifully finished houses are just 5 minutes walk to the local shop, pub, restaurants and the quaint pier. Master double room with ensuite, 1 twin room upstairs, 1 double room (4ft bed)and 1 double room ensuite downstairs. Features: TV & DVD, CD, Radio, Stereo. Kitchen including microwave, dishwasher, washing machine/dryer. Bed linen and duvets provided. Beds are made up on arrival . Cots are available on request Private car parking. Oil central heating. The island is a beautiful, scenic base from which to explore south Kerry and offers an abundance of sporting and historical activities.